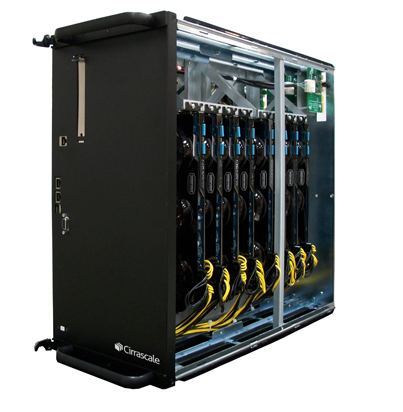 Like many companies, Cirrascale has a few key technologies and components that it uses in a variety of it’s products. A lot of what we do involves being able to move data around; be it around the world between datacenters, around racks within a datacenter, or around components within systems. For moving data between components, we frequently make use of PCI Express (“PCIe”), as it’s become a ubiquitous protocol for interconnecting high-speed components. 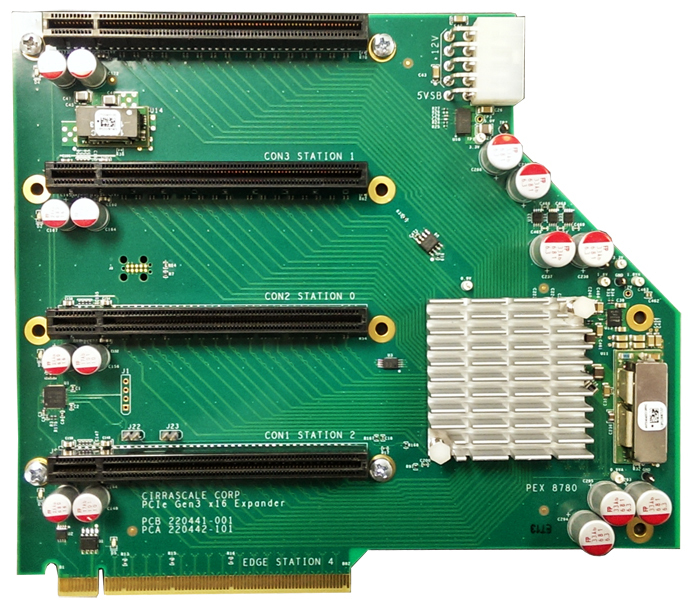 Lately, we’ve had a lot of customer and partner activity surrounding products making use of our 4-slot 16-lane PCIe risers, meaning I’ve had to spend some time working with customers on integrating their components. This often means digging through the output of lspci(8) to track down what the PCIe topology looks like, and verifying at a high level that nothing horrifically bad is happening. Unfortunately, the manpage for lspci(8) and pcilib(7) talk a lot about options, and not a lot about how to use the output, so many of our partners and customers can’t just RTFM to get the lay of the PCIe land. What usually happens is that we end up taking a stroll through lspci(8) output. Our first stop is to build a map of the PCIe system. Fortunately, PCIe is pretty straightforward in that it’s addressing can always be expressed as a finite tree structure, so the “tree” output of lspci(8) is your friend. Our target device, the SAS2008 controller, resides as the PCIe device 01, function 1, on the 00 bus, in the 0000 PCI domain. Traditional PCI address notation is of the form “Domain:Bus:Device.Function”, so our device’s full address is “ 0000 : 00 : 01 . 1 “. We can use lspci(8) again to explore that device, but instead of the tree view we’ll just use verbose output. This verbose output shows us that it’s a PCIe root port, owned by the Intel Xeon CPU (which is where PCIe controllers reside in modern x86 systems). Of particular interest is that the link capabilities (“ LnkCap “) of this particular port are PCIe Gen2 (“ Speed 5GT/s “) with 4 PCIe lanes (“ Width x4 “). A few lines down in the output, the link status (“ LnkSta “) shows that the port is operating at it’s fullest capabilities using 4 lanes of Gen2 PCIe. Since the PCIe root is actually a bridge, it creates a 2nd PCIe bus, and bridges traffic between the Xeon CPU side (“00″) and that new bus (“02″). Referring back to the lspci(8) tree view, we can spot the address of our intended target device. Just like before, specifying the particular device (this time “ 0000 : 02 : 00 . 0 “) will get us details. As with the bridge device, we can examine the link capabilities (“ LnkCap “) and see that the part is capable of PCIe Gen2 (“ 5GT/s “) and 8 lanes (“ Width x8“). Although the link is capable of “x8″, the link status (“ LnkSta “) is only 4 lanes (“ Width x4 “). This is because the PCIe bridge which we looked at first only had the capability to support 4 lanes, so when the SAS2008 part and the PCIe bridge negotiated their connection, it had to end up at the lowest common denominator: “x4″. Now that we’ve found our target device on the PCIe bus, what kinds of interesting things can we learn about it? The answer is of course “lots!”, but let’s focus on the address space reservations and the integrity of the PCIe bus. Since most of what the SAS controller does is move data from disks to system memory, it only needs a few pieces of memory. The 256 bytes of I/O ports (“ size=256 “) is located in low address space, where real-mode applications can access it (for configuration and really slow I/O), and then there are 16K (“ size=16K “) and 256K (“ size=256K “) blocks of address space that are (presumably) used by chip-specific drivers to access the buffers on the controller and serve as DMA targets. All-in-all, pretty unexciting. This SAS controller, like most modern PCI devices, support “ Advanced Error Reporting” (“AER”). We can see from the device status registers (“ DevSta “) that the device has experienced some sort of correctable error (“ CorrErr+ “). Since the error was a correctable error (“ CorrErr “), the interesting part of the AER output is the correctable error status (“ CESta “). None of the bits are set except for the non-fatal error bit (“ NoNFatalErr+ “). By the name of it (it’s an error, but not a fatal one…and it was correctable! ), this sounds like nothing to really be concerned about. Checking if the error is masked or not (“ CEMsk “) shows that the device vendor elected to mask that error (“ NonFatalErr+ “), so they didn’t think it was something that should be tricked up the PCIe device chain and handled either. In truth, the PCI-SIG defines Correctable Non Fatal Errors as “Advisory” errors, and note that is should be used as an indication of a software problem, not to be indicative of an issue with the integrity or functionality of the PCIe bus. 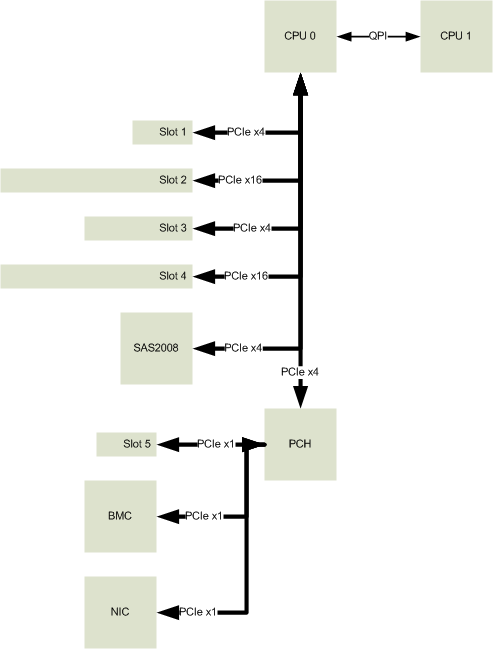 As is probably obvious, there’s not usually much call for looking at PCIe devices that are embedded on a commodity motherboard, but the steps to figuring out where a particular device lives on a PCIe bus, and how it is behaving are the same for most any device. A more common case these days, as I mentioned earlier, is helping customers and partners follow these same steps for products like our GB5400. Here the PCIe connection is 16 lanes of Gen 3 (“ LnkSta “, “ 8GT/s “, “ Width x16“), which matches what we’d expect from our block diagram. The AER flags don’t indicate that any correctable or uncorrectable errors have occurred (“ UESta ” and “ CESta “). Looking at the PCIe side of that same link shows a slightly different story. Although the current speed and width of the link are the same as on the PCIe root port (whew! It would be really bad news if they weren’t! ), from the PCIe switch point of view there are some correctable errors: Receive, transaction layer, and the non-fatal error we saw in the prior example (“ RxErr+ “, “ BadTLP+“, and “ NonFatalErr+ “). All of the errors are masked (“ CEMsk “), so a reasonable course of action would be to verify bandwidth and latency across the bus meet expectations, and then decide if the errors need to be resolved. Of course, the root port to PCIe switch connection is only relevant with traffic between GPUs and the CPU (or other GPUs on the other PCIe switch). Also important for most of our customers is inter-PCIe riser traffic between GPUs. To explore that, we’d want to look at the PCIe interface of the GPU itself. From our lspci(8) tree output, the first GPU resides as device 0 on bus 3. The output tells us that GPU 0 is operating at 16 lanes of Gen3 PCIe, and has similar correctable errors to what we saw before: Receive and transaction layer (“ RxErr+ “, “ BadTLP+ “). Since similar errors are occurring on multiple devices using the PCIe switch, one could make sure the PCIe switch is applying appropriate equalization to the links, and that the actual packets sent appear correctly formed. Realistically, however, tracking down masked correctable errors usually only makes sense if it is materially impacting performance of the PCIe devices. (In this particular situation, bandwidth across all links of the PCIe switch was extremely close to the maximum, and we decided the problems were effectively cosmetic). It’s unfortunate that much of the lspci(8) documentation is lacking examples, but fortunately most of our Cirrascale customers and partners are happy to work with us to ensure the solutions we’re delivering meet their expectations. After going through the steps above, we usually end up with a successful solution that lets Cirrascale offer uniquely capable platforms for GPGPU, MIC, or I/O intensive applications. Cirrascale Corporation is a premier developer of hardware and cloud-based solutions enabling GPU-driven deep learning infrastructure. To view additional press releases, visit our corporate press releases page. ©2016. All Rights Reserved. Cirrascale Corporation.